Do you need a sewing table for quilting? So you’ve got your awesome sewing machine for quilting, your tools and notions and a project in mind. Your fat quarters are spread out over the dining room table, (which is covered with a cutting mat), along with your quilting rulers, rotary cutter and all your other tools! You start your cutting and piecing, look at the clock, OH NO, dinner time, time to clear the table…. Solution? a dedicated sewing table for quilting! There are many different types, sizes and prices, choosing one depends on your space and budget. 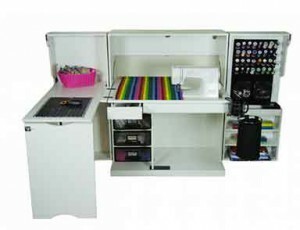 There are extension tables for a sewing machine but again, you need a workspace to put it on. This kind of table adds extra space to the left of your sewing machine. 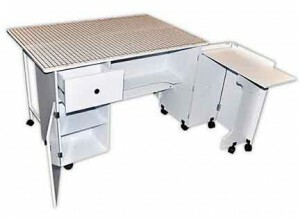 Most of these extension tables are made to fit all kinds of sewing machines. 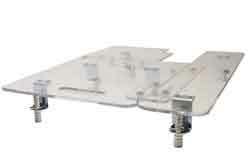 The custom-fit sewing table is one that your sewing machine slots into, like the Janome Universal Sewing table. I can’t see much advantage to this table compared to the previous extension table apart from the fact that your quilting machine is off your dining table! It adds more room to the left of the needle, like the extension table, but slotting the machine in this way means no free-arm sewing. The custom-fit sewing table can be useful for sewing your larger garments on but doesn’t offer much in the way of work or storage space. The Sullivans Home Hobby table is really just like a drop leaf table. When the sides are folded down it takes up little space, 13L by 36W by 36H. It gives you plenty of space to work on and folds away neatly when you’re not using it. You can buy a cutting mat specifically design for this table. Of course, you could go to a thrift store and pick up and drop leaf table for a few $ and a standard cutting mat. In my view, this would do the same job as the Sullivan Hobby Table. At the other end of the scale, you have the large cabinet type with drawers and shelves, like the Sullivans Quilter Table shown in the image. The downside with these are they need a dedicated space, you can’t just fold them up and put them away. The grid lines on the top can be useful for general dressmaking, but it’s not a cutting mat, you couldn’t use your rotary cutter on it! This cabinet type is designed to maximize every bit of space, with drawers and a side table to pull out for your sewing machine. 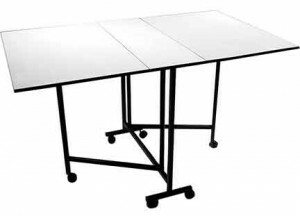 The Sullivans quilter table is a good design, with the space saving fold out melamine table. The open dimensions are 47L x 35.5W x 29.75H in and the closed are 47L x 35.5W x 29.75H in. This table does the job, but you need a decent size space to keep it in. 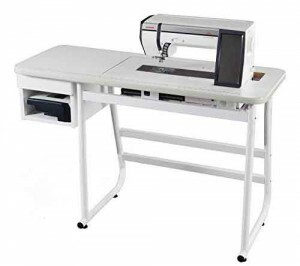 The most convenient sewing table for quilting, especially if you’re limited for space, has to be the kind that has storage and also folds away. My top choice would be the New SewingBox table, (currently unavailable) it looks awesome! When closed up it’s only is 39″ long x 22″ wide, and all your quilting bits and pieces are shut away inside. perfect if you need to tidy away for guests or visiting toddler grandchildren. It is expensive however as a space saver that does what it’s supposed to do then worth the spend! The limitations are the table size when opened out, there’s not a huge amount of space for laying out and cutting. 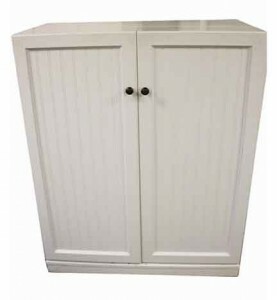 If you’re handy with DIY or know someone who is, you could design and make your own shut away sewing cupboard. There are many ways you can adapt existing furniture. Palak, over at Make it Handmade has a great sewing table hack. There are also some neat ideas over at Pretty Prudent if you have a dedicated craft room. The main thing is to try and find a table that suits your home space, your budget AND gets your work off the dining table! Hopefully, my suggestions will give you some ideas. Let me know what you use as a sewing table for quilting, any of the above, or have you designed and made your own. These are some great suggestions for sewing tables. I do recognize the “dinner scenario” :). In our house it seems like the kitchen table is the heart, that`s where everybody hangs out, do homework, sew, eat… so yes it would be nice with a table dedicated to only sewing. You have given some great suggestions on tables, have to look into the sewing box table, looks like a good choice. While I’m personally not a sewer as such (I think my hands aren’t quite suited for such things!) I know of a few people who are that may be interested in an appropriate new table for all their quiltmaking and sewing needs! Yes, its so annoying to have to share a craft space with general family life, the constant packing/unpacking and worry about things getting dirty can drive people around the bend! I really like the look of the New Sewing Box Table, it’s so nifty how it packs down. This will be so useful for people living in smaller spaces, I might consider getting one myself. I live on my own now but have 4 kids, the dining room table was always “busy” never any room for my sewing and quilting! The New Sewing Box Table was my favorite choice too, I’d love to have something custom made like that, in cherry wood! Hey Kathy, what would you suggest for a condo? We have a decent sized place, but it is tough to fit a big table in here, especially with the outer wall being mostly windows. I got a hand me down sewing machine from my grandmother, but I haven;t done much with it because I don’t really have the proper set up. Your suggestion would appreciated!